1793, Philadelphia. The nation's capital and the largest city in North America is devastated by an apparently incurable disease, cause unknown . . . In a powerful, dramatic narrative, critically acclaimed author Jim Murphy describes the illness known as yellow fever and the toll it took on the city's residents, relating the epidemic to the major social and political events of the day and to 18th-century medical beliefs and practices. Drawing on first-hand accounts, Murphy spotlights the heroic role of Philadelphia's free blacks in combating the disease, and the Constitutional crisis that President Washington faced when he was forced to leave the city—and all his papers—while escaping the deadly contagion. The search for the fever's causes and cure, not found for more than a century afterward, provides a suspenseful counterpoint to this riveting true story of a city under siege. 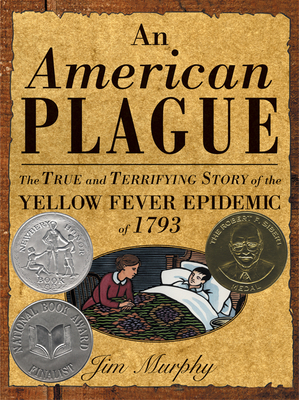 An American Plague's numerous awards include a Sibert Medal, a Newbery Honor, and designation as a National Book Award Finalist. Thoroughly researched, generously illustrated with fascinating archival prints, and unflinching in its discussion of medical details, this book offers a glimpse into the conditions of American cities at the time of our nation's birth while drawing timely parallels to modern-day epidemics. Bibliography, map, index.